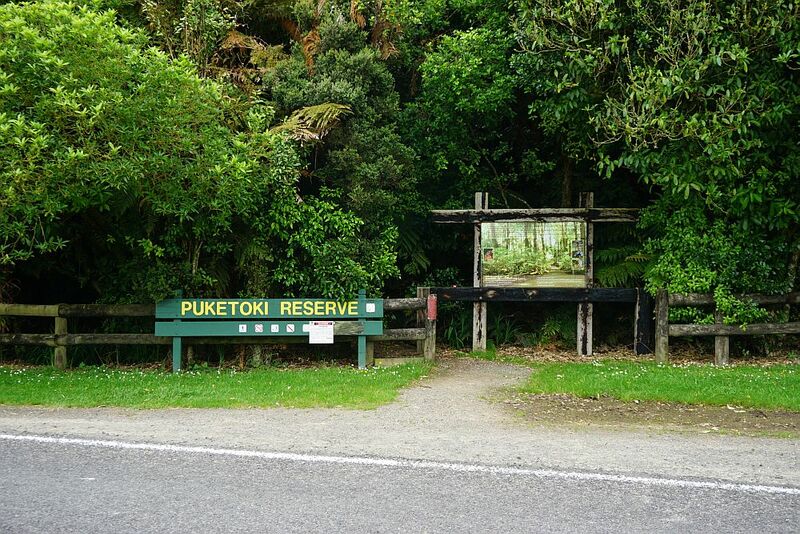 Puketoki Reserve is only a short distance from Tauranga, accessible from Leyland Rd, off Whakamarama Rd. 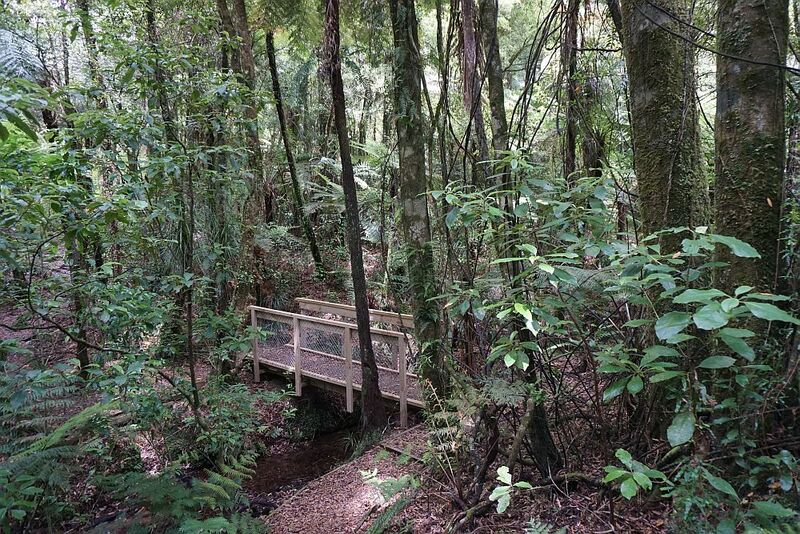 The reserve consists of 85 acres of bush, donated to the Whakamarama Community by Mr Henry H Sharplin of the Whakamarama Land and Timber Company in 1926. Before that time it was milled, so the only old surviving trees would be those not suitable for timber at that time. Tramways for transporting logs passed through the reserve, and in a few places the location of the tramways can still be seen.There is a parking area and picnic area on Leyland Rd, across from the reserve entrance. 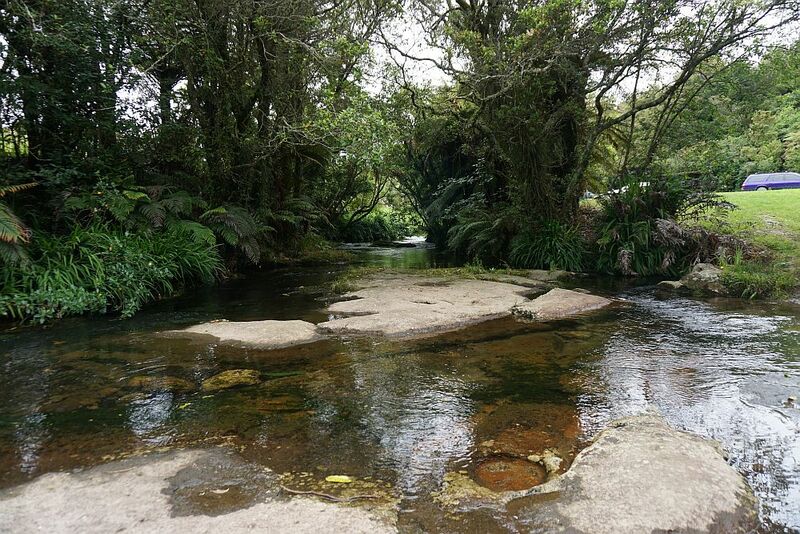 The Te Puna stream runs past the picnic area. There are toilet facilities near the reserve entrance. It is one of the oldest reserves in the Western Bay of Plenty, and dogs on a leash are permitted in the reserve. The reserve is not managed by DoC, so there is no reference to it on their web site. Also the tracks are not shown on the latest NZ Topographic maps. There are two loop tracks, a short loop and a long loop. Most of the short loop is shared with the long loop nearest to the reserve entrance. The long loop is posted as a 1-hour walk, with the short loop at 20 minutes. However, both loops together are about 3.2 km in length and can be walked in about 1 hour, while taking time for photos and reading the information panels. The short loop is an easy walk with no steps and only gentle slopes. The long loop has a few steps in various locations, but there are no steep inclines. Both tracks are well marked and well formed. The Te Puna Stream, with the parking and picnic area on the right. The entrance to the Puketoki Reserve on Leyland Rd. Near the entrance there is a reconstruction of a short piece of tramway complete with carriages and a log on the original tramway location. 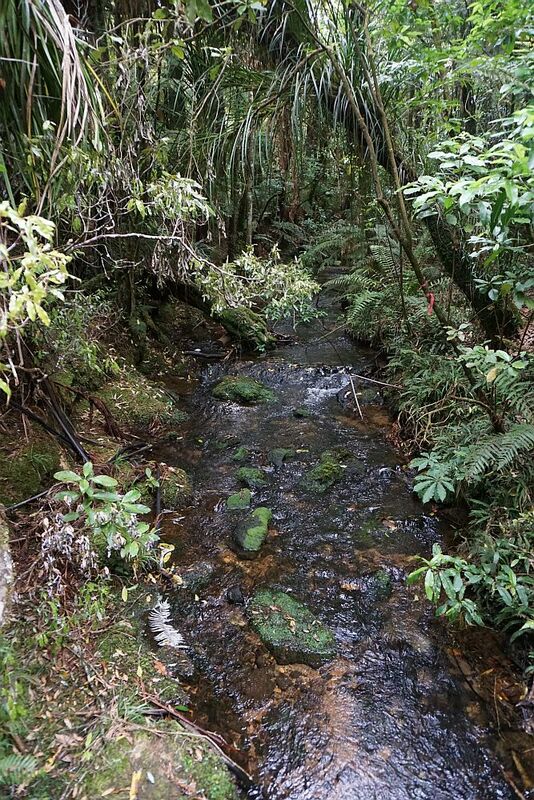 Several streams run through the reserve, joining to become Te Puna Stream. There is a bridge on the track at each crossing of a stream, so there is no need to get wet feet. 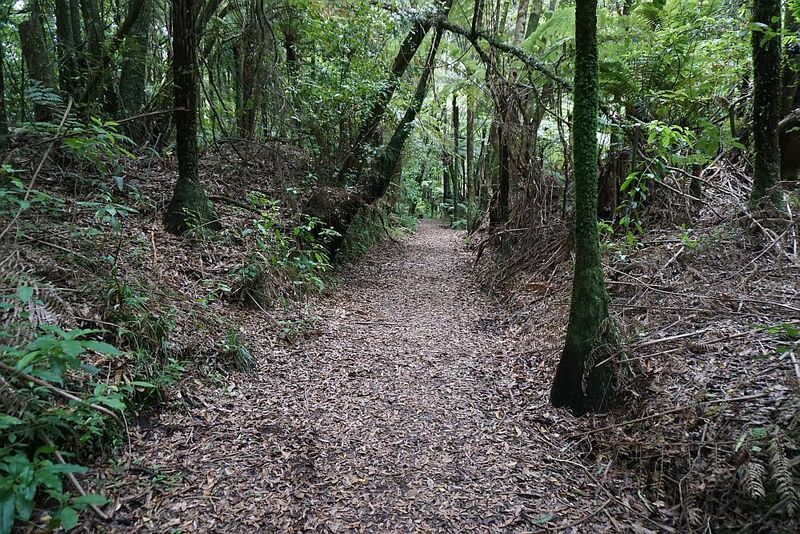 A short side loop off the long track leads to a Rimu with Rata Vines. 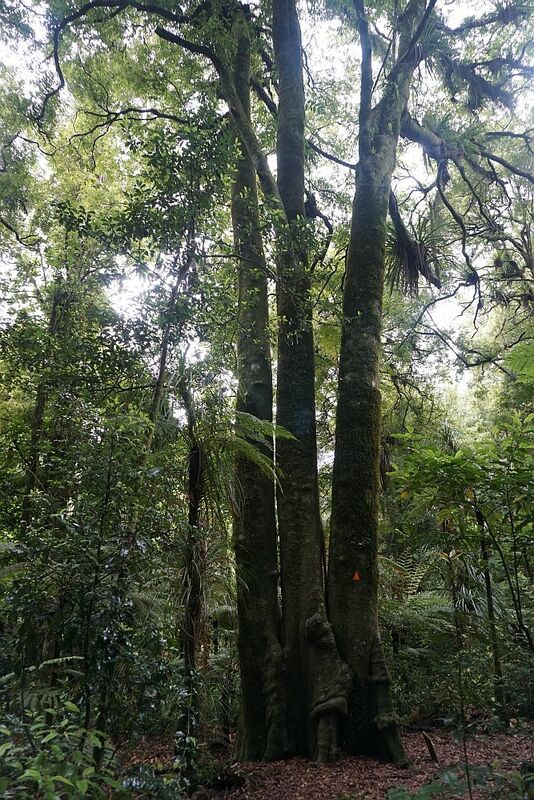 The Rata starts growing near the top of a tree, sending down flying roots to get nutrition and moisture from the soil on the forest floor. 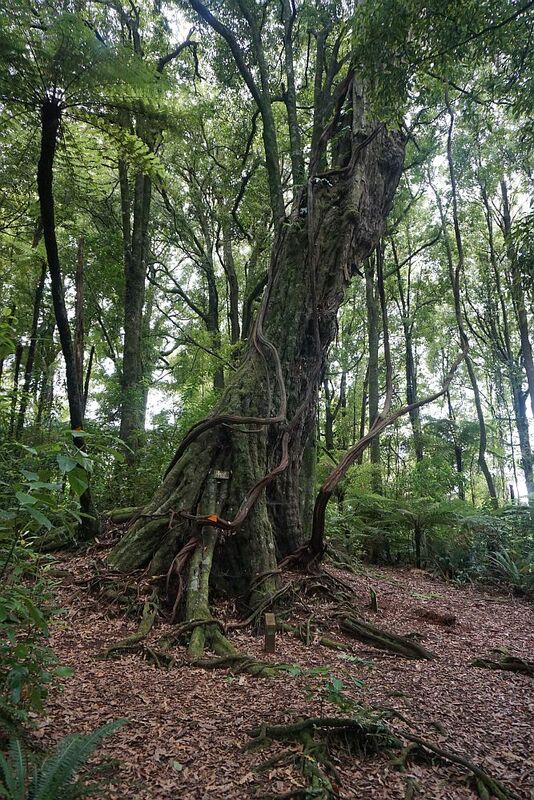 Gradually the roots and Rata vines encircle the tree and can kill the tree, leaving a hollow Rata tree. Rata is a close relative of Pohutukawa. This three trunked Tawa tree by the long track is known as the 3 sisters. 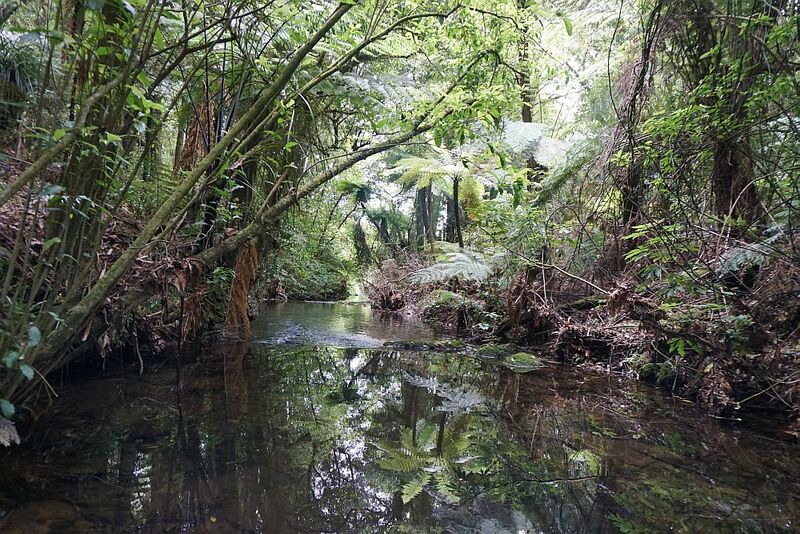 The Te Puna Stream runs through the reserve. There’s a swimming hole next to the southern branch common to the short and long track. No swimmers today, and only two people and two dogs were encountered during the walk. The tree canopy is reflected in the stream by the swimming hole. The tramway ran along this straight stretch of walking track from the swimming hole, past the trolley with the log by the entrance, to the toilets next to the reserve entrance. 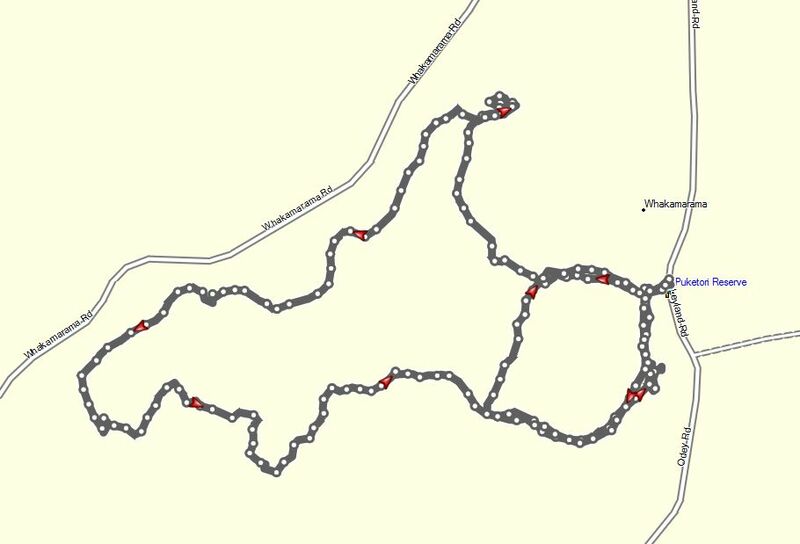 The GPS track log shows the long loop and the short loop. The reserve entrance is to the east, on Leyland Rd. 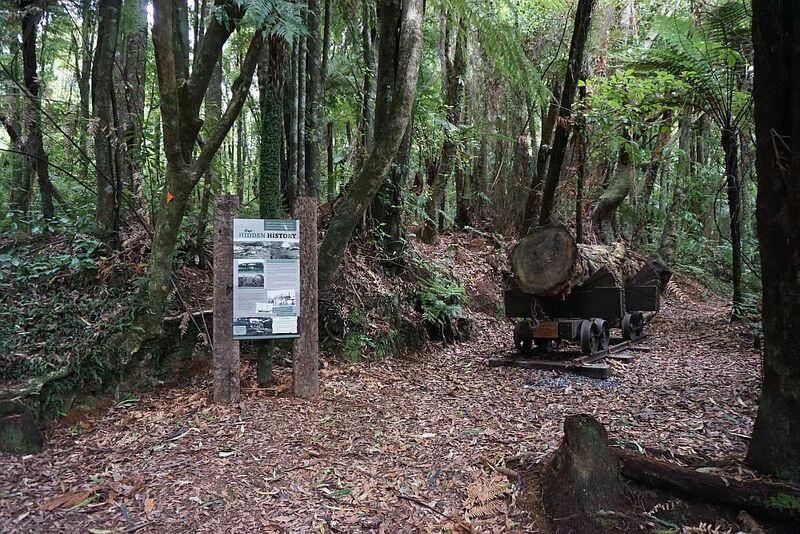 The short track to the Rimu and Rata Vine tree is at the northernmost point of the long track. Both loops were walked on December 25, 2014, with a total distance of about 3.2km, taking close to 1 hour to complete. 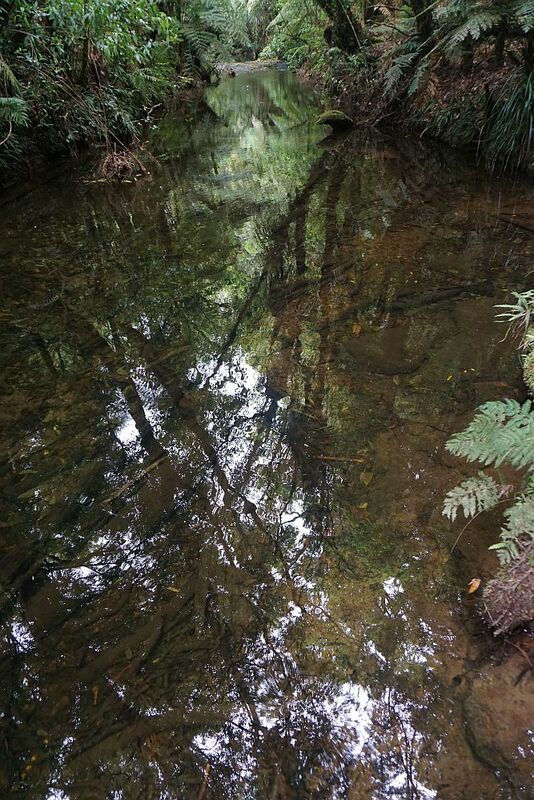 This entry was posted in Walks and tagged Puketoki Reserve, Tauranga, Whakamarama on 2014-12-25 by nzartig.